Visit the privately operated Zizi Restaurant at the Free State National Botanical Garden for their affordable delicacies and the yummiest of hearty food. Visitors can bring the whole family and enjoy good service, with a stunning view of the Garden. 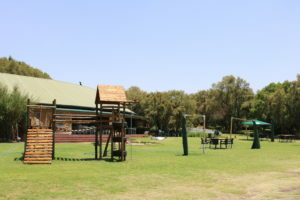 Children can play in the play garden in front of the restaurant while you relax with a sundowner. With menu items such as bobotie just like grandma used to make – with secret herbs and titillating spices – you’ll be filled with nostalgia that only good food and company can bring. Milk tarts, decadent chocolate cakes, pancakes, pumpkin pie and ginger beer will tickle your senses while the welcoming atmosphere and calmness of the setting will make you want to have more…and more…and more! The restaurant is open six days a week, Tuesday to Sunday only, from 08h00 until 16h00. On Mondays the restaurant is closed, unless booked for special occasion. During the week a variety of light meals, quiches and cakes are served. Sunday offers a buffet lunch of traditional “boerekos” with a variety of starters and deserts. Booking is essential for the Sunday buffet. Contact Theunie Kloppers on 082 394 6747 or email iets.niets.catering@gmail.com to make your booking or to discuss a catering quote for your next function.